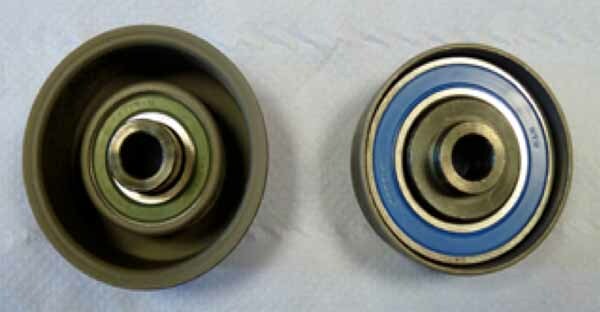 One of the reoccurring repair issues that has become a problem for the independent workshop is the failure of the idler pulley on the 1.7 diesel engine fitted to many General Motors (GM) vehicles such as the Vauxhall/Opel Astra, Combo, Corsa, Mariva, Vectra and Zafira. Although the problem ultimately stems from the timing belt being too tight, it reveals itself in damage to, and very often the subsequent failure of, the idler. 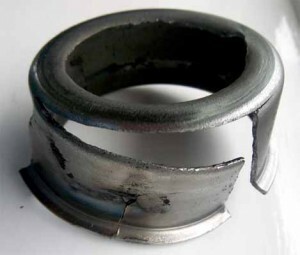 The pressure exerted on the idler when too much belt tension is applied can result in its distortion and break-up, with the obvious catastrophic consequences. 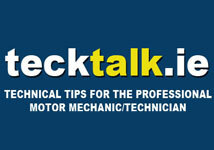 This is a potentially costly and damaging outcome, so it is therefore vital that technicians fit an original equipment (OE) quality timing belt such as a Dayco High Tenacity (HT) belt – which is the OE fitment for the majority of diesel engines used by European VM’s – and take great care to adopt the correct belt tension when undertaking this repair. Despite the fact that both versions of the idler have been designed and produced to withstand the stresses of the engine to which they are fitted, it is essential that the timing belt is fitted following the correct procedure and adjusted to the tension specified by GM. 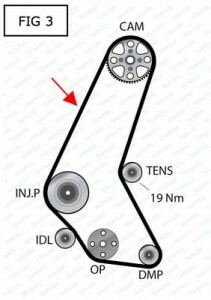 As aforementioned, failure to set the correct timing belt tension could result in the failure of the idler, (Fig 2) so Dayco recommend the use of a quality belt tensioner tool like its Tensiometer to ensure that the correct tension is obtained and reliable timing belt performance maintained, this is done by ensuring the tension is correct between the camshaft and injection pump pulley (Fig 3). To do this use the Dayco tensiometer and insert the unique test code 1262028 and measure the span of the belt in the normal way. If the tension reading on the Dayco Tensiometer is high, represented by up to 3 “+” signs then the tensioner must be completely released and the full tension procedure must be adhered to until the digital display on the Dayco Tensiometer says “OK”. If the tension is too low, represented by up to 3 “–“, then it is possible to adjust the tension spring with the allen key until the digital display reads “OK”. The tensioner MUST not be altered under any other circumstance. Dayco is one of the world’s foremost OE suppliers of power transmission components to automotive and commercial vehicle makers in all markets across the globe. The engineering partnerships that it has established with these manufacturers over the years have yielded many innovative design solutions that have made a significant contribution to overcome the challenges that vehicle manufacturers (VM’s) face in the pursuit of increased engine efficiency. As a result VM’s have been able to develop engines with ever-lower exhaust emissions, which also return reduced fuel consumption. This technical experience means that Dayco is well-placed to provide the automotive aftermarket with a wealth of practical knowledge that can aid the repair process for the professional technician faced with any power transmission related problem. The combination of OE quality products, technical expertise and marketing support like the three-year warranty on its HT timing belt kits, make Dayco the first choice for discerning professionals.